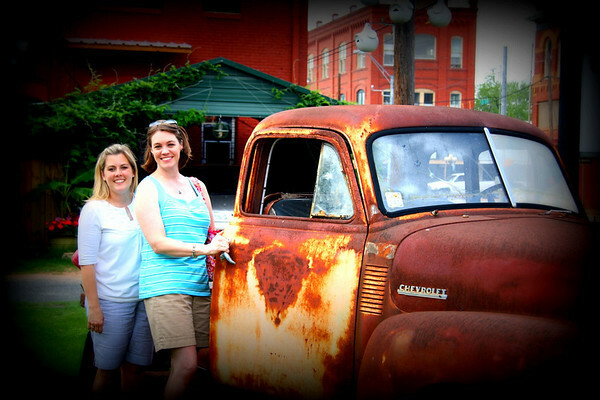 The girls and I spent our weekend enjoying the perks and quirks of small town Texas. 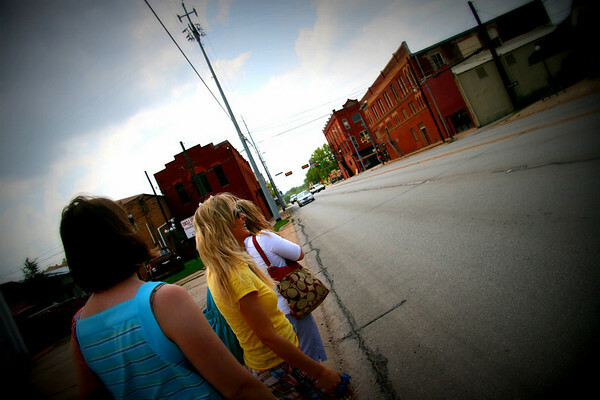 Smithville is Heather's darling hometown and most of her family still calls it home. Every time I visit a place, I always want to move there (and I always think I'm serious), and Smithville is no exception. The pace is slower, the people friendlier, the number of streetlights--two. 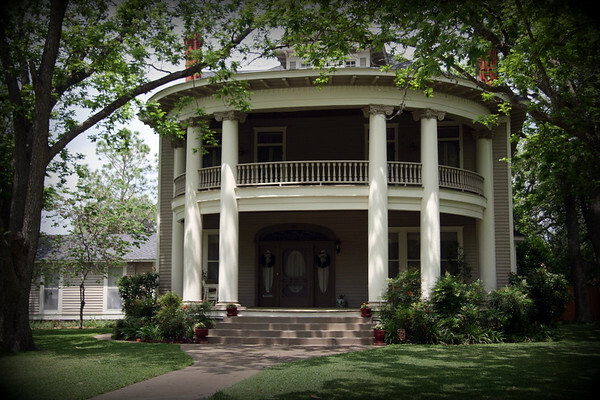 In 1997 Smithville was the setting for the movie Hope Floats, which is one of my all time favorite chick flicks. This is the house where Sandra Bullock called home. Isn't it GORGEOUS?!?! 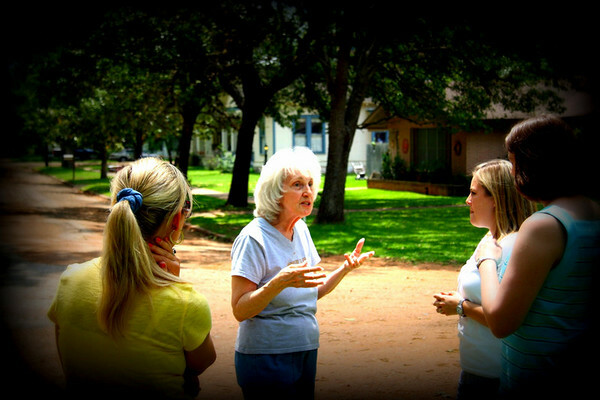 One of the sweet neighbors took some time to tell us some stories from when the actors and crew were set up in her side yard. I think her name was Gladys and she was a hoot! Plus I liked her choice in footwear. Earlier that afternoon we ate delicious BBQ at the world famous Zimmerhanzels. Well, I don't know if it's world famous, but it did make Texas Monthly's list of best BBQ joints. 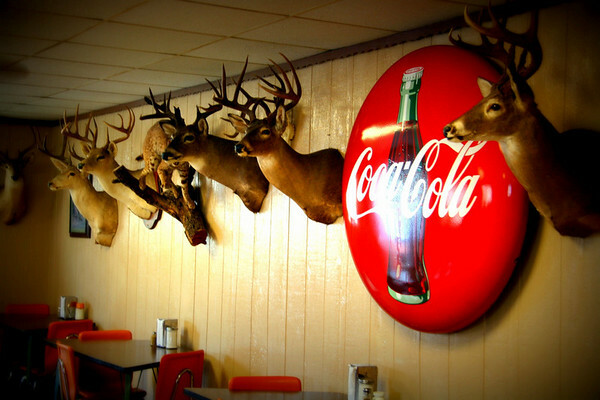 Don't let the deer on the wall (plus one small cheetah) alarm you, this place serves up mouthwatering BBQ. We each got a chopped beef sandwich, small potato salad and iced tea for $4.01!! 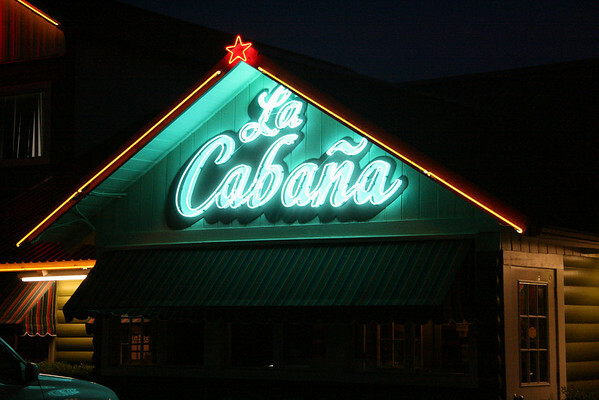 Delicious and easy on the pocketbook. Downtown has lots of character and charm. 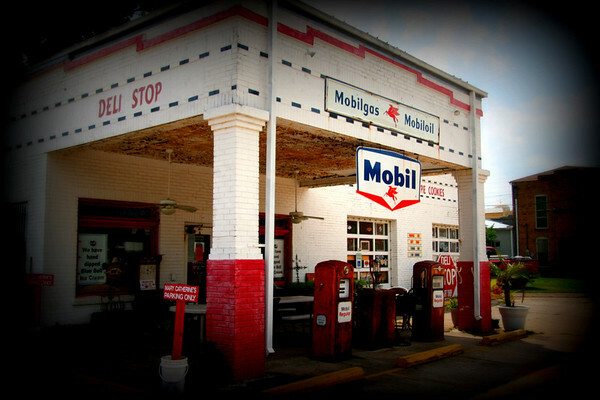 This is Mary-Catherine's deli and gift shop in the old Mobil station. Isn't it cute?!?! Heather, Kim, Robyn and I lined up to greet Lacie as she drove into town. We were SO excited to see her! 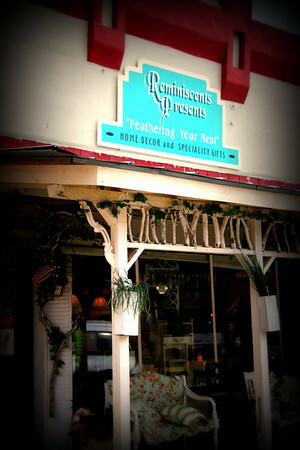 We stayed in The Nest, which is a bed and breakfast in the back of this delightful gift shop. 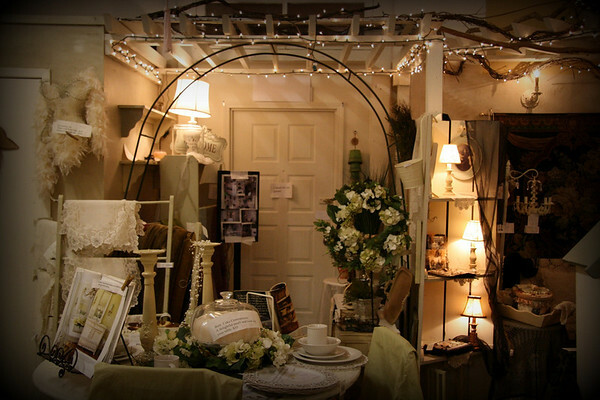 The shop is filled to the brim with all kinds of pretties and cutesies. A few things definitely came home with me at the end of our trip. We called this the Magic Door because behind it was the B&B, also filled to the brim with pretties and cutesies. There were three bedrooms, a den, kitchen and bathroom, each room decorated within an inch of its life. Here we are in the little nook I slept in. 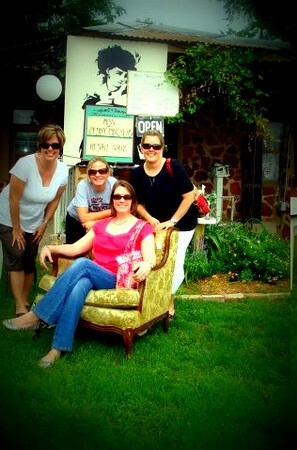 We spent Friday afternoon popping in and out of all the cute antique shops in downtown. They have the cutest pharmacy that got me tickled because there is only one of each item on the shelves, when they sell it then they put out another. Love that! 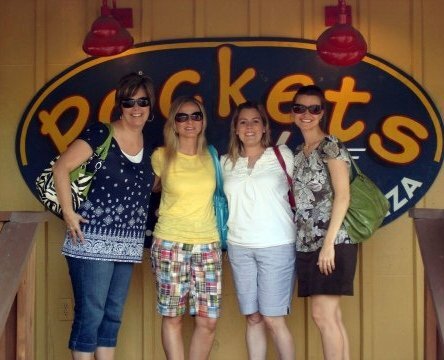 After an afternoon of sightseeing, window shopping, giggling and picture snapping, we were treated to a delicious supper at Pockets by Lynn, Tawana and Becky. I had a tasty green chile burger with sweet potato fries. YUM! The restaurant is filled with memorabilia, like the Snappy Shots sign from the photo place where Sandra Bullock worked in the movie. 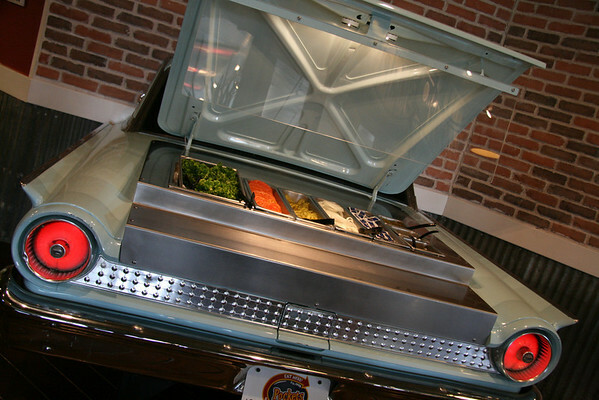 Check out how they serve the fixin's for your burgers. Love that! 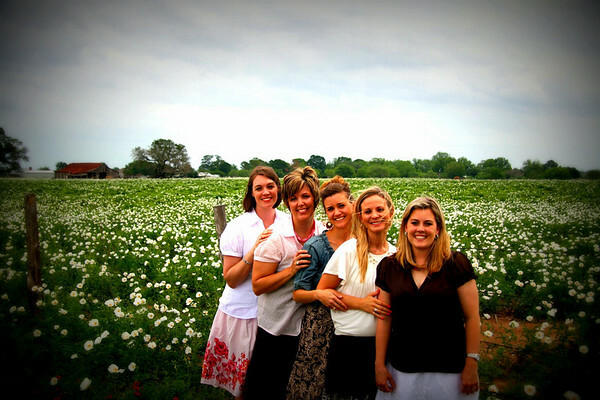 Saturday, after Ladies' Day, we stopped beside a field of pretty (yet quite prickly and itchy)wildflowers for a photo. Sunday morning we went to the local nursing home where Heather's parents and a few others conduct a short worship service for the residents. It was so touching and uplifting to sit, sing and hear the Good News with them. The church members come early to help them get dressed and down to the main room, help them turn their song book pages and assist them with the Lord's Supper with such love and respect (some of them are not physically able to take it by themselves). What a wonderful ministry and service they are doing! After that, we went to worship service at the Smithville Church of Christ. Everyone was so friendly and welcoming, it made me long for small congregations. I know there are benefits and side effects of both large and small churches, but coming from a larger one I certainly could appreciate the more personal flair. 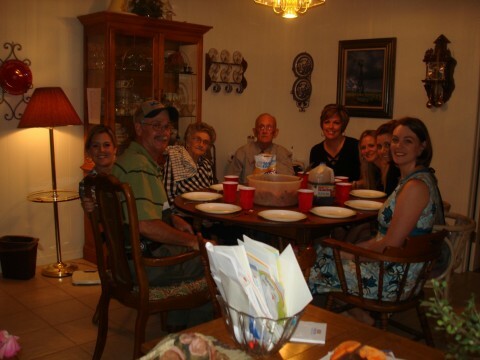 We went back to Heather's sweet Nana and Poppy's home for lunch, which was affectionately called Hog Dinner. Can you guess what that was? A huge taco salad that was delicious (I think they call it Hog Dinner because everything gets dumped in one large bowl, then when you add the dressing it gets, well...sloppy) served with sweet tea and homemade pecan pie for dessert. Oh my goodness it was sooooo good! Aren't Nana and Poppy precious? Oh YES they are! They are in their 80s and have been married for 67 years (I think). Thanks to them, I was again reminded of the impact and importance of hospitality. Nana has been recovering from open heart surgery these last several weeks, yet she did not let that stop her from inviting us all over for Sunday lunch together. We all pitched in, it was simple food served on paper plates for convenience, all that matters though is time together talking, sharing and laughing over a meal. Priceless memories! and one last picture together. In the middle of the street no less. Did I mention that I LOVE small towns?!?! the photos in this post are amazing! I am touched about the story of the worship service for the elderly patients- beautiful. p.s. that house in the first shot- wowza!! 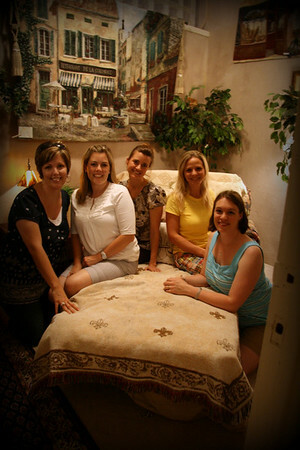 Smithville looks totally charming, what a great place to have a girl's weekend. You're all adorable in these pictures. The service at the nursing home really touched me and stuck with me as well. Such love. I really wanted to pull my camera out of my bag to take pictures, but didn't think I should. 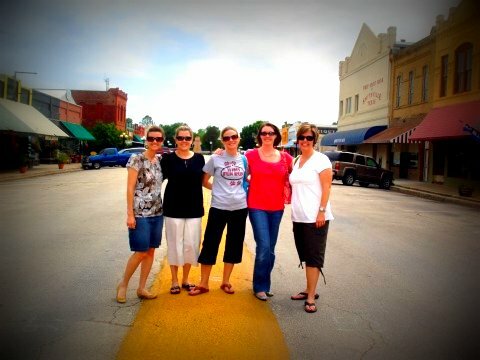 I totally want to watch Hope Floats again now that I've visited the town! My mouth is watering for true Texas bbq!--I lived in Bryan/College Station for about 13 years. My papa still lives in Ft. Worth...whenever I visit him, we always go to a local bbq place that serves the best chopped brisket and potatoe salad with lots of sweet pickle and mustard! I also love the charm of small towns...Smithville is no exception! Loved reading about your weekend and the photos are so great! I love the one in front of the wildflowers. I don't know how you stay in a town like that and NOT want to move there! Oh, Holly! Your posts make me happy. I love all your pics from the 'ville and wish we were still there laughing and shopping. I had so much fun showing you all around my old stomping ground! What a great weekend! Thanks for the sweet words about my family...they loved all of you so much! Love you girl! Holly! I love this post too. Gordon laughed at the one in front of the flowers because even though they were pretty to us it was "stinging nettle". OOPSSSSS. But, your pictures are great. I have taken my camera to the rest home and I made them a collage of all of them. Next time you come, bring Baby with you. They love to have their pictures made. Love you! Wow. How fun. Lucky, lucky, you. Ok, I am seriously DYING over the cuteness. This was AMAZING!!! Such a lovely little town. Your visit to the nursing home for church reminded me of a scripture I read this week. James 1:27. Perfectly applies! Great pics - and I love Hope Floats. I cry every time I see it. gorgeous!!! and i love these pictures. wow. this makes me miss texas in a big way. 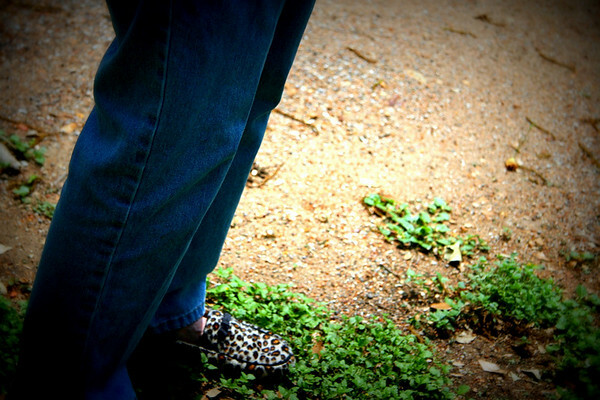 i miss the bluebonnets and the fields and the little towns. i miss the people!! what an incredible trip, holly- and how cool you got to do with friends and incorporate social AND spiritual aspects. so great.